Rosette Wreath with word rosettes! So here we go. I made a base from a ring of matboard and then printed this sheet of words. 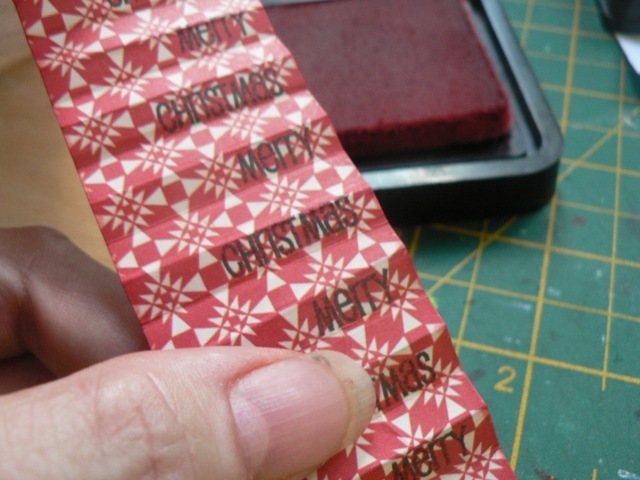 It’s spaced so the cut strips can be added, wider spaces for the longer words and shorter ones for the small words. All are 1 1/2 to 1 inch wide. I left the sheets attached to the printer paper so I could score all the strips in one go, THEN peel them off the sheet to fold and collapse the rosettes. 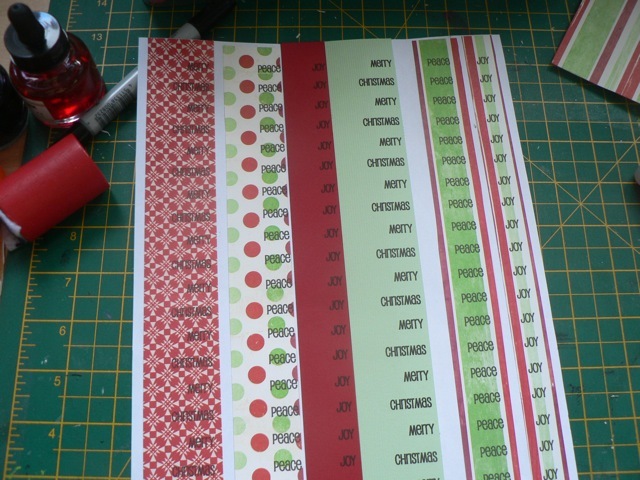 I hoped the Merry Christmas on the red patterned paper would be clearer, and I may replace that with another one – so do test out your papers to make sure the words are clear enough for you! Then I will attach them to the frame. Like so. Now I need to do 3 or 4 more to fill in the gaps, then tidy up and get the new project out. 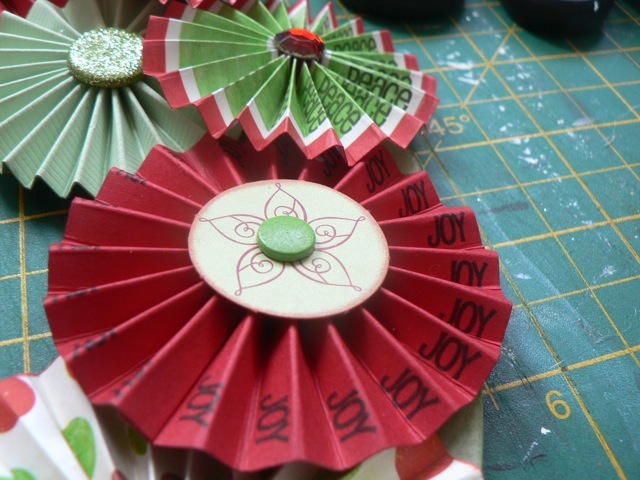 And at some point I will carry one with my idea to fit the word strips to the TH rosette die, now I have it. Oh there is nothing more frustrating than an idea delayed! I missed about four crops in the last 8 weeks, at least two chances to get my mitts on that die, and it’s been making me crazy. I feel certain it can be made to work – in fact someone commented on the YouTube show that same idea, so it’s not just me who thinks it’s a good one – but so much easier to deal with the die, the cuts themselves, and not just the measurements! Bear with me while I play. 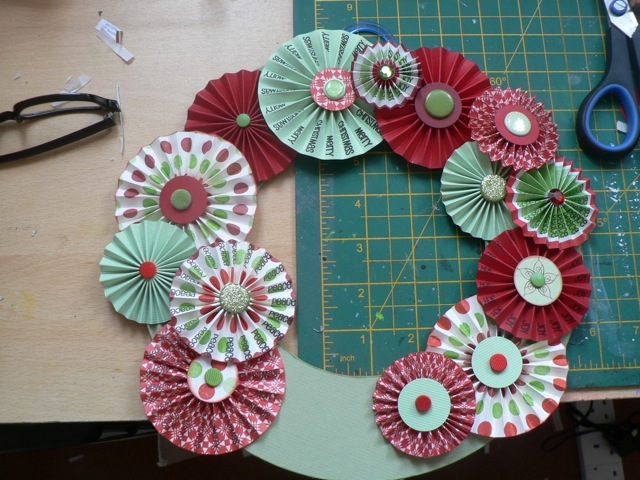 Categories: Christmas | Tags: Christmas, rosettes | Permalink. You are the coolest, funniest blogger I have read all week! Oh, and I love your Youtube doodah video and project as well. You made a HUGE smile and fuzzy warm feeling in my thoughts today! Thanks so much for sharing your project and your walls down self ! Blimey! You are truly too kind. And glad I’ve amused you – that makes me happy! This turned out really nice! Great job! I read you everyday via email. I just had to come tell you how fabulous this is. Thanks for sharing!! !